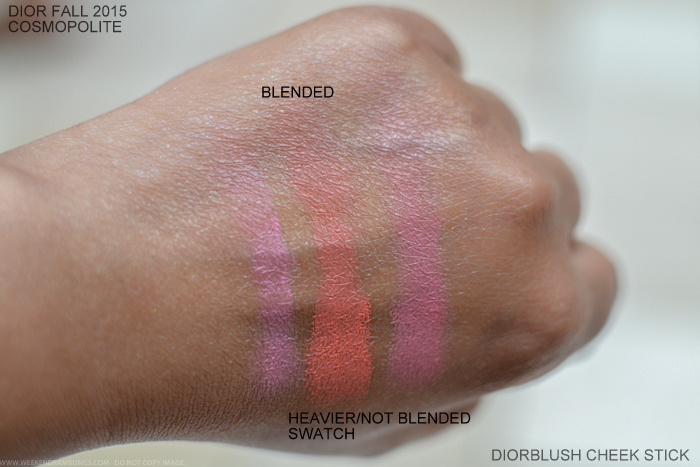 There are 3 blush sticks in this collection - Diorblush Cheek Sticks - that are slightly thinner than the ones from Chanel and seem almost like really fat pencils. The texture seems very smooth (in a silicone-y way, but I haven't looked at the ingredients list), and when blended, the blush feels almost powdery. 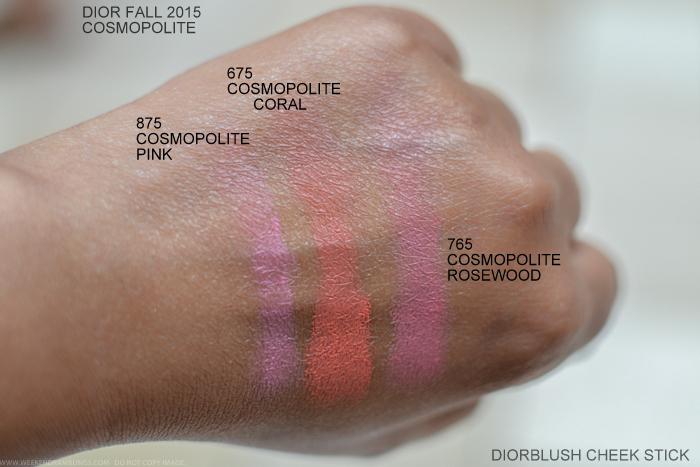 While the colors are very bright, these blushes do sheer out quite easily. Of the three, Coral (675) shows up best on my darker skin. Edit: The blushes are pigmented, but while they can look scary bright when swiped, they blend easily and look quite natural on the skin. I meant they "sheer out" in a good way :P Sorry about the confusion. Same photo as above but without all that scribbling :P I have blended the swatches towards the top just to give an idea how the blushes can be sheered out. 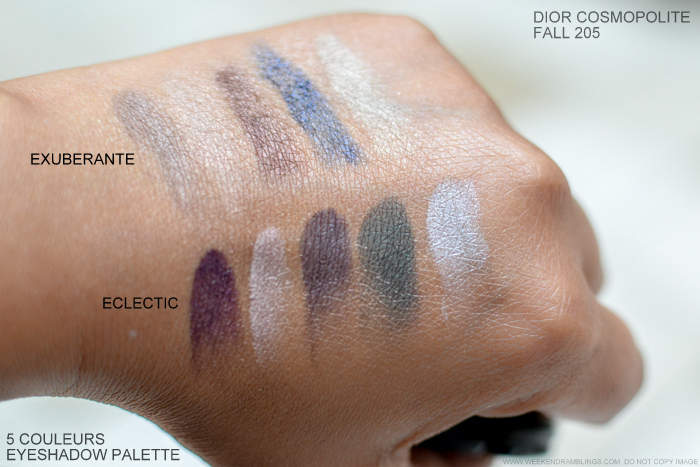 The Dior Addict Fluid Shadows are a new launch and are shimmery/metallic eyeshadows in a liquid/fluid formula. 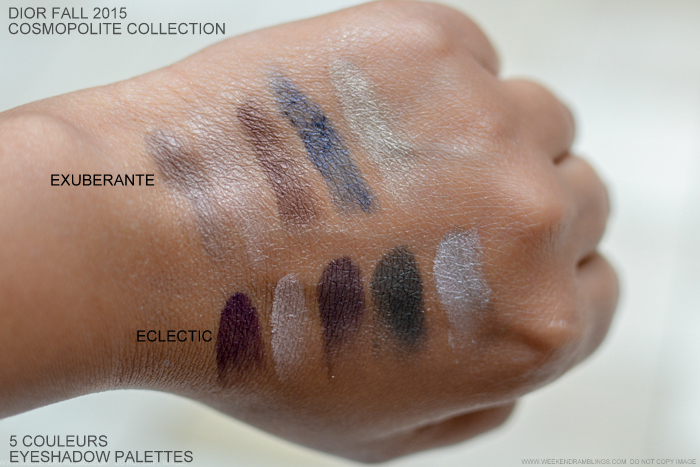 Unlike some other fluid eyeshadows I have tried, the Dior Addict Fluid shadows didn't appear to stay separate (biphase) in the tube, and I didn't need to shake the tube before use. 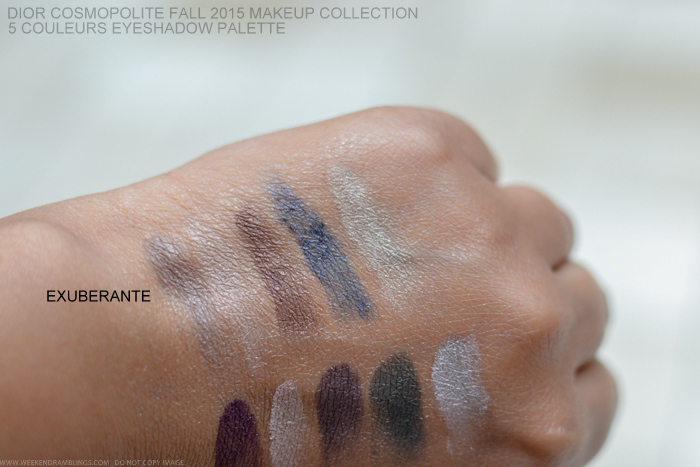 These eyeshadows can be applied intense as in the swatches below or blended out to a very sheer haze of color. They set quickly (at least when sheered out) and the SA did need to use a makeup wipe to take them off. If applied as a thicker swipe like in my swatches or if used as a liner (optional use suggested by SA), these would need a bit of time to dry before they set. 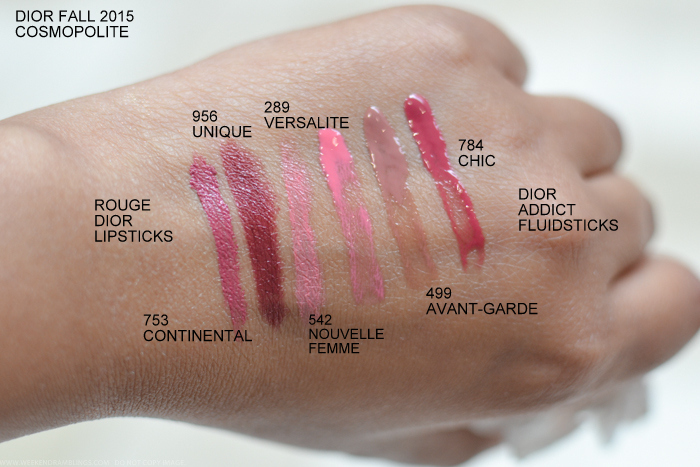 The lip colors in this collection include 3 Dior Rouge lipsticks and 3 lipglosses - Dior Addict Fluid Sticks. The colors don't seem all that unique, but the lipsticks do feel creamy and moisturizing. Also included in this collection are nail polishes, a highlighter, and 3 shades of concealer. 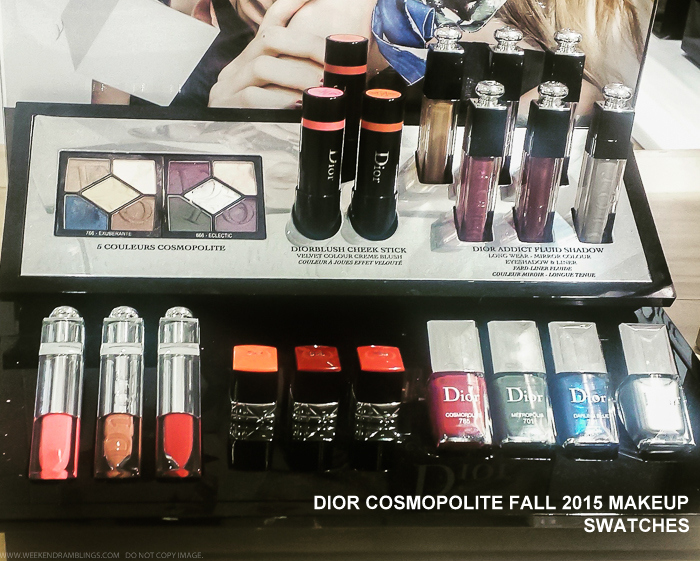 My favorites from the Dior Cosmopolite Fall 2015 Makeup Collection would be the eyeshadow palettes and the blush sticks. 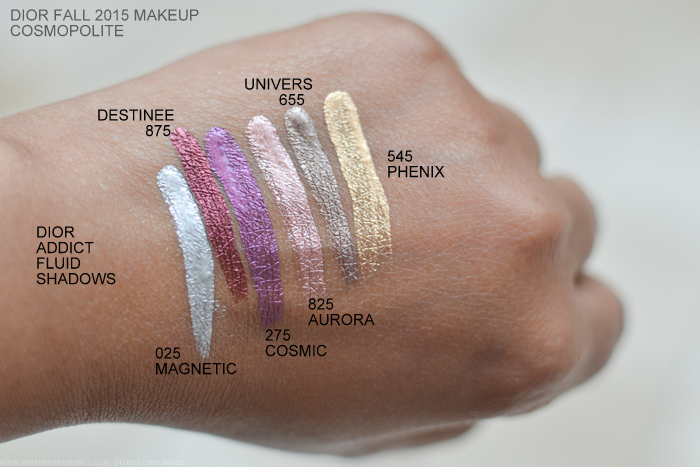 I am not a fan of metallic/shimmery shadows, so the fluid shadows don't really really appeal to me, but they do seem interesting.